Thinking of hitting a theatre to see Prospect next week when the film debuts in NY and LA November 2? You may want to grab your headphones and listen to my review of Prospect as well as an interview I did with the film's writer/directors. 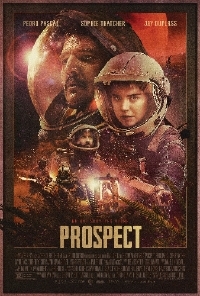 Written and directed by Zeek Earl and Christopher Caldwell, Prospect follows a father-daughter on a journey to a jungle moon in search of the ultimate payday where and the two quickly fall prey to unknown terrain and dangerous encounters as their mission turns deadly. PROSPECT stars Pedro Pascal, Sophie Thatcher, Jay Duplass, Andre Royo, Sheila Vand, and Anwan Glover. Interview below along with the film's latest trailer.